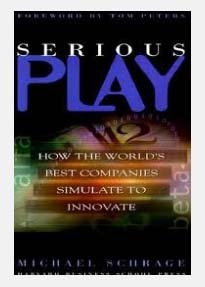 Michael Schrage’s book, Serious Play, offers us Insight into Thinking about our Supply Chain Models. …modeling isn’t some magic activity that is done by technical folks in the corner or that you completely outsource to consultants. In a previous post, I talked about ways a model can go wrong. In this post, I wanted to give you a different perspective. Models can go wrong if you don’t think about them in the right way. That is, modeling isn’t some magic activity that is done by technical folks in the corner or that you completely outsource to consultants. To get the most of out of modeling, you should think of it as a chance to learn about your business. “Bigger Isn’t Better” (pg 131-137). The object of the prototype or model isn’t to be as complex as reality. Instead, the model needs to be understood by those who need to make decisions. “The act of designing the model…is essential to understanding their use” (pg 168). He argues that there is value in putting the model together. We see this as well and think it is well worth your time to understand some of the underlying math. When doing modeling, you should think about the value you get by going through the modeling exercise, not just the final answer.